Before engaging in the competitive sport of paintball, equipping yourself with a protective gear such as the best paintball mask is imperative. Truly, this game spurs fun and teamwork, but putting up all the safety measures always comes first. Whilst it serves as a protection, wearing the a paintball mask also ramps up your confidence and lets you fully immerse in the game! Although it may seem quite a cinch to find the gear that perfectly fits you, there are several factors you have to consider first. But with all the overwhelming options on the market, how can you choose the paintball mask that suits you best? How can you pick out the ultimate gear without breaking your bank? And what are the other advantages of wearing a paintball mask? In this article, I have delved into significant factors and vast researching to unravel the answers to these questions. I have come up with an in-depth buying guide and a compilation of the 12 highest-rated paintball masks on the market. Sifting through the vast collection of paintball masks on the market, I have found the 12 best picks and jotted them down in this comprehensive list of reviews. 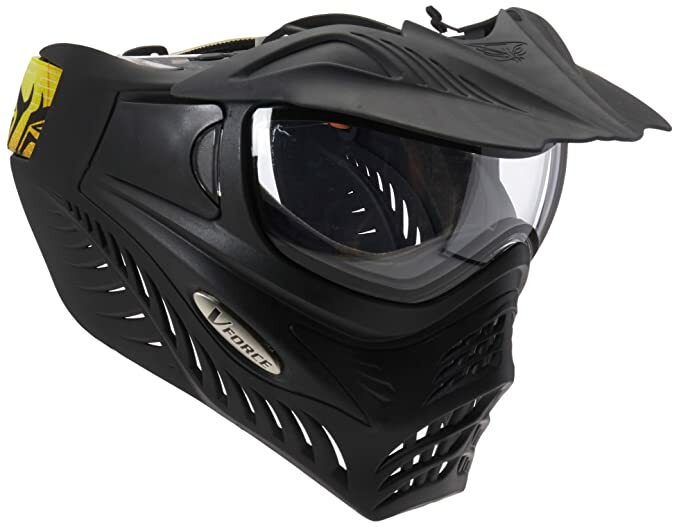 One of the best picks I found is the Virtue VIO Ascend and I guess it stands out among the rest of the paintball masks on the market because of its quick interchangeable and thermal lens. Getting through the paintball field, visibility is a vital element and Virtue VIO highlighted the mask with the anti-fog dual pane thermal lens. While it wards off the fog, the large lens also elevates the peripheral field of view that allows you to revel in the game with better focus. Plus, the lens is scratch-resistant. Streamlined with comfort and lightweight feature, these goggles do not shrug off the protective properties due to its profile design and adjustable straps. 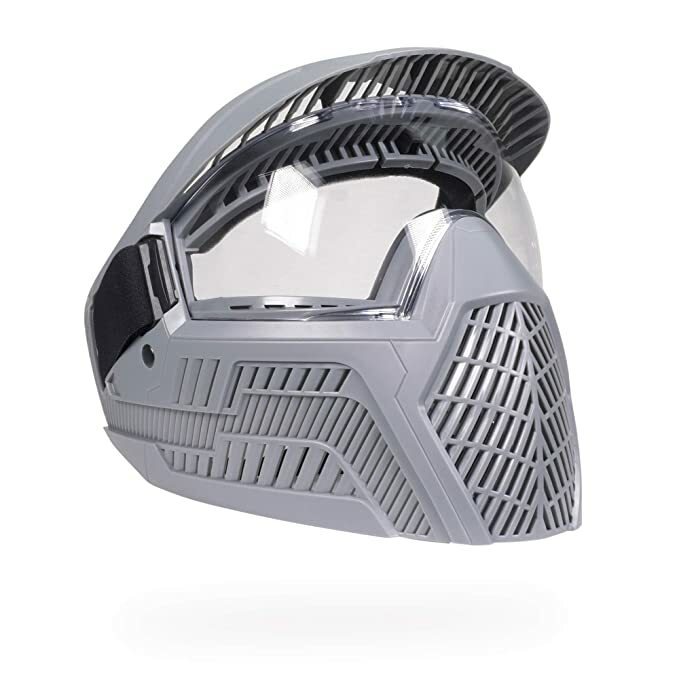 The flexibility provides full protection to the ears, chin, and all over the face and therefore, renders durability that will combat with you all throughout the paintball games. 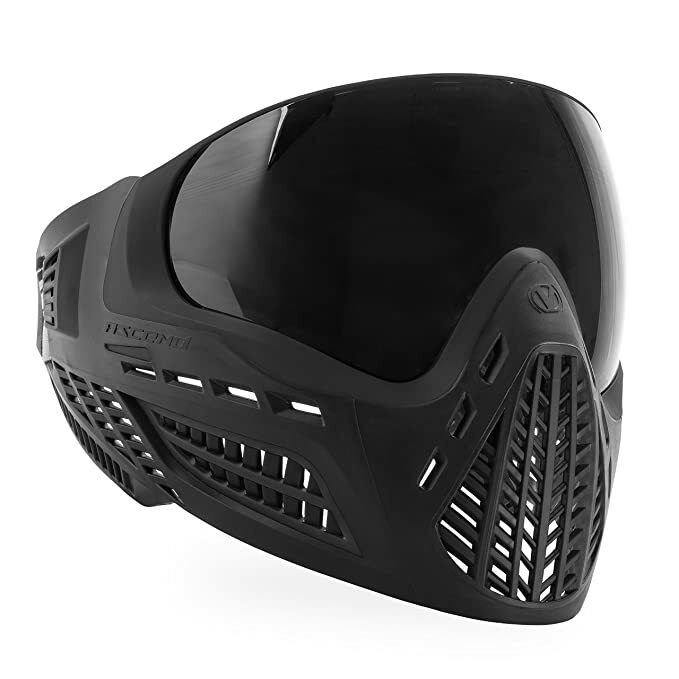 I also like how the features can keep up with the advanced paintball masks available without getting way over the price. But how about the players that wear prescription glasses? Is the Virtue VIO a good option? For averaged-sized frames, it can fit without straining your view. It’s a bit hard to find the best paintball mask for glasses but Virtue VIO might just be a great fit! However, players should take note of the size to ensure secure comfort and fit as it may run a little big for the face. Another way to spruce up your gear with ample protection and relatively impressive peripheral vision is with the Dye Precision I4. I won’t deny but the very first thing I’ve noticed about these goggles is the remarkable craftsmanship. They look chic and cool that ramps up your game, but the highlight is the adaptable comfort, in my opinion. This mask offers comfort for all facial contours and the closed cell foam technology reinforces the comfort and support even more so. Perhaps, the compression formed ears add up to the comfort and protection. I like how such a feature also helps wick moisture away. Besides the style and function, the Dye Precision I4 boasts its anti-fog thermal lens and horizon peripheral vision for excellent visibility. The level of protection for the chin, forehead, eyes, and ears is right on the dot and provides only a little surface of exposure. In addition to this attribute, the mask is designed with multi-directional scream venting that keeps the sweat and moisture away, elevates breathability, and able to transmit your voice clearly at the same time. The Dye i4 has superb features that can keep the pace alongside quality masks on the market. But the price tag can be a bit expensive for young players. The size might also run small for players with larger heads. At a glance, you’ll see the Virtue VIO is such a dapper paintball mask; it’s all about stealth and style! Delving into its features, I was really hyped by the 3D molded foam propad and enhanced earpads that provide additional grip, comfort, and protection. And of course, these features also give a few tweaks on the exterior that exhibits cool aesthetic – more like a pro! Virtue has been consistent with their mask collection and with these goggles, the thermal lens with fog-resistant properties are retained that even when you breathe or talk, it keeps off the fog to give you a better and clearer vision. The ventilation also takes part in this advantage. This paintball mask must be a steal for players with prescription eyeglasses and can probably be deemed as among the best paintball mask for glasses you can find. I also have noticed that this paintball mask doesn’t have echo ear pads that reduce a resounding effect and thus, makes the communication between the players not quite a hassle! You can mount a GoPro right on the top of the mask if you wish to film the game in action. But if you want to attach it on the side, there isn’t any option and it might be a little difficult if you want to. If you want to step up in the game, the Dye i5 paintball mask might just give you an awesome revamp! Just like any other masks, it has the basic features but what I actually won me over was the e.VOKE Wireless Air Sync that sets up a wireless integration between your M2 and i5. This instant communication renders vital game time deets and automated reports and audio alerts! The aforementioned advanced technology is matched with a large anti-fog lens for a peripheral vision which is I think is inevitably vital if you want to be ahead on tactical advantages. Besides the optimal protection for the eyes, the Dyetanium lens function to shield your eyes from the UV rays. And if you need a quick change of lens, the i5 comes with a low profile rapid lens change that you can do within seconds! With all these superb features, I also liked how the i5 keeps the comfort right up to par with the compression formed ears, which protect and keep the ears cozy at the same time. Besides being lightweight, the multi-layer foam provides a secure and comfortable fit so you can get the game running! It is always exciting to tweak your gear with a few advanced elements but there is a bit of a catch: they can be costly and this Dye i5 is relatively expensive compared to other masks on the market. 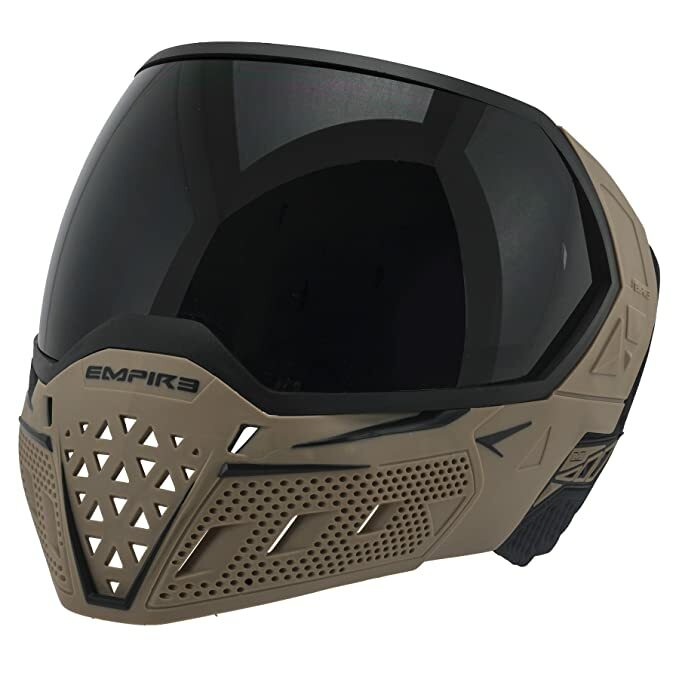 The Empire E-flex carries out the fundamentals of a paintball mask; it resists the fog and delivers great quality vision due to the thermal lens with zero optical distortion. And if you want to take distinct strategic points in the game, maximum angle and clear view are vital elements and that’s what the Empire E-flex boasts about with their clear and dual pane design. Tagged with an affordable price, you won’t have to get way over your budget. In regards to the comfort properties, the flexible ProFlex style skirt reinforces the ventilation and voice projection, which I think are significant features when you are basking in the paintball game. Clear and constant communication between the players is imperative without deafening yourself with a loud sound. So, I guess, the ProFlex is quite a steal. Besides the clear lenses, it is equipped with Empire Pro Style strap that provides extra grip, comfort, and support. The thermo-foam ear pieces also add comfort and protection to your ears. And because the mask itself is incredibly lightweight but durable, they are much easier to wear and take off. Cleaning is no hassle, too! Here are some notes you probably need to jot down: the Empire mask have interchangeable lenses but can be a bit difficult to replace or change at times. And because its design does not showcase full coverage, particularly on the head, you may need to wear a headband for added protection. 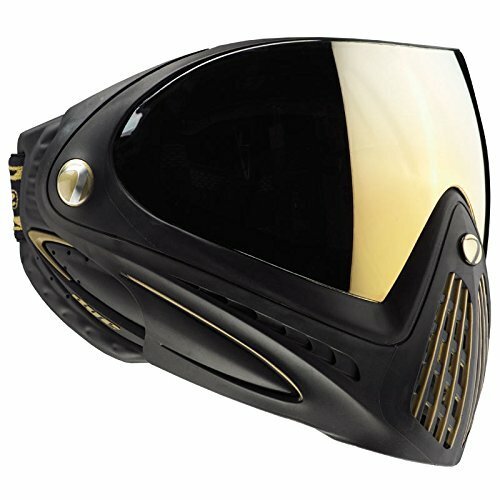 If you are just starting off in paintball games, you may need to spend a few bucks for an affordable paintball mask without getting pretty cheap with the specs. For beginners, the BASE paintball mask could be an ideal gear to start with, particularly when you’re all after the level of protection. Structured from a strong and comfortable polymer material, it lends a durable protective layer that meets the paintball safety standards. For the ballistic protection, BASE designed the mask with a sturdy shell to hold out against .68 and .50 caliber paintballs and 6mm airsoft projectiles. Although sleeked with the basic features, I think such protection can stand up against the other masks on the market. Streamlined with wide angle and dual pane thermal fog-resistant lenses, you get a clear view to spot your enemies and showcase your tactical moves without fogging up. The contoured profile, on the other hand adapts to the face for full coverage and better fit. The adjustable strap and the chin strap reinforce comfort and support. Another feature I liked is the built-in visor that adds protection against the intense heat and glare of the sun! The clear lens of these goggles are great for optimal view and angle but at some point, may not provide enough protection against the glare of the sun. If you are considering yourself a neophyte in the world of paintball, finding the ideal protective mask might seem difficult. But if you need full face coverage with added protection on the head, the Invert Helix Thermal could be a great pick. 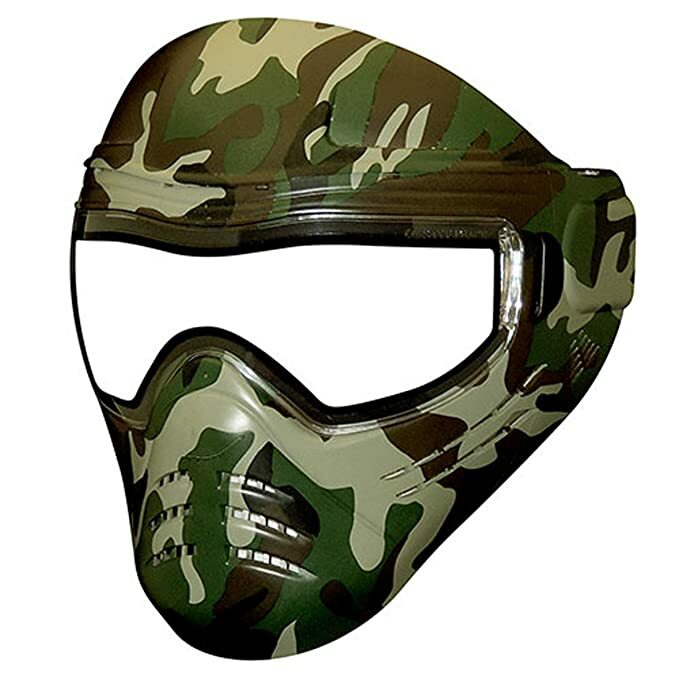 At a reasonable price, you can get yourself a nice tweak to your paintball mask with the detachable visor to keep you off the heat and also to work as an extra layer of protection. The interior has soft foam right around the eye area for a comfortable custom fit. 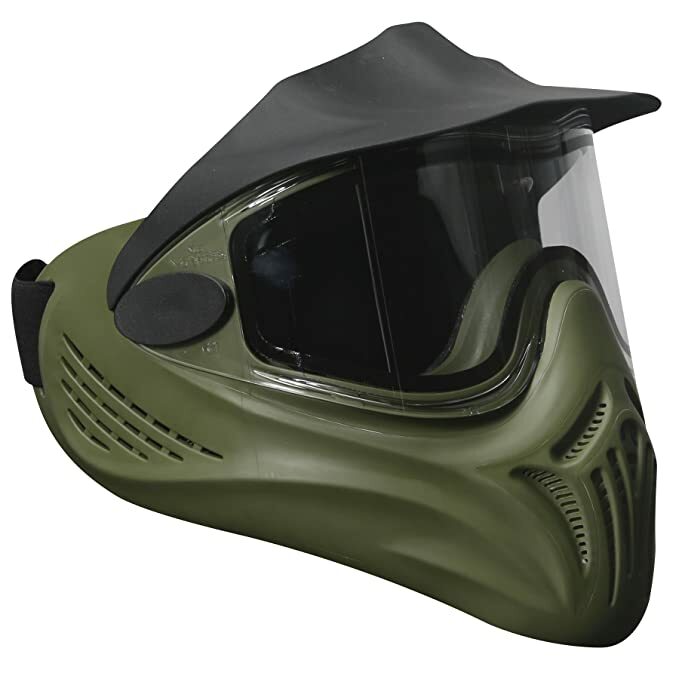 The outer shell also exhibits a sturdy construction that can provide optimal protection against paintball hits. And with its large clear lenses, disruptions are minimal and you get to revel in ample view and angle while you target your rivals in the field. 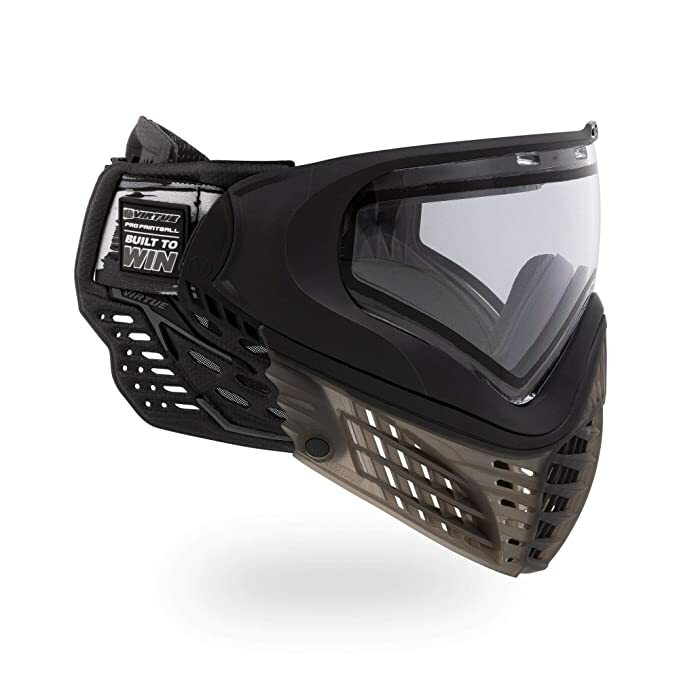 If you need to sport your mask with averaged-sized prescription glasses, Invert Helix can fit and can probably your choice of the best paintball mask for glasses at an affordable price! With all these great features, I find the olive shade a clever touch that can make you look more invisible. The light smoke thermal lens delivers a bit of shade that can protect your eyes from the glare without compromising your view. Plus, they are fog-resistant that keeps the game running without fogging up your mask! Ventilation is an essential feature of any paintball mask. The Invert Helix, however, tries to keep it up right at the standards, but still needs to improve the ventilation. The size of the mask can also be a concern for some players who wear eyeglasses with large frames. Unfortunately, this might not be a good fit. This paintball mask in slate gray is another entry from BASE that renders quality protection and secure fit. Quite similar with the specs from the previous BASE paintball mask, this hue gives off a cool aesthetic but exhibits both function and style. The lenses are large and clear to make sure you get the best view while ravaging the paintball field! Engineered with the robust shell to combat paintball strikes and airsoft projectiles, these BASE goggles could be your protective gear on your next game. It is also designed with optimal wide angle and dual pane thermal fog-resistant lenses for utmost visibility while warding off the fog. The ample ventilation also elevates the breathability and wicks the moisture away. The mask itself truly is a piece of style and comfort. But I guess the functional fit spruces up the comfort for custom feel and secure fit. Inevitably, it’s vital when you’re running through the field and the adjustable straps for the chin and the goggles make the mask easily worn and keep it snug all the time. These goggles might be an ideal choice if you prefer to forgo high-end versions with advanced features and style. This mask is all about the basics. The lens is in 3D and cut out in a sunglasses-inspired shape that heightens the view for unrestricted vision. It also showcases a straightforward design with all that sleek spherical lens that gives off a much cooler vibe! But besides all the aesthetics, GI Sportz structured a durable build that can withstand paintball hits. Formed with soft rubber on the central area of the face, the bounce factor and shock absorption are more efficient and reliable. In addition, lenses are anti-scratch and engineered with distortion-free optics so you can take delight in optimal angle and view while spotting on your enemies and teammates on the game. I also find the lenses pretty impressive with their customizable feature; they can adapt to any light conditions and thus, minimizes the glare. The lenses are thermal anti-fog, too, that prevents the mask from fogging up! The built-in visor also adds protection and shade against the sun. To maximize the comfort and secure fit, the straps of the mask and along the chin are adjustable. The interior is also structured with foam to ensure the mask sits on to your face comfortably and since they are quick-change, you can just take it off and replace it with another foam in just a snap! If you are looking for a mask to wear with your prescription eyeglasses, this might not be the best option you can give a shot to. Perhaps, you can go for a bigger size and try if it can accommodate your eyeglasses. If you are looking for a large lens to get your prescription glasses to fit, the Empire EVS might just come in handy. Looking right at it, I really thought the large-sized lens is a showstopper that highlights the ample room even for large-framed glasses. It also promotes greater angle and view with the 270-degree peripheral vision that is immensely essential in targeting your rivals in the field. The lens is thermal and anti-fog that empties out the fog for a much clearer vision. And if you want to replace the lens, they are interchangeable and can be quickly replaced without any tools needed. But this does not strain the durability and the co-injection molded lower skirt allows the hits and impact to bounce efficiently. And even the lens can hold out the hits as it is protected with scratch-resistant properties and anti-reflective as well that shields the eyes against the UV rays. With regards to the comfort, Empire ramps it up with the triple density foam that also wicks the moisture away. It also lends maximum comfort and secure fit allowing the mask to sit on your face and ear. Even when you communicate with the other players, it allows you to hear and transmit your voice clearly. However, the price tag is still up for discussion and I think some young players, especially those who have just been starting off might find it expensive. I also find the vents pretty cool but perhaps, can be improved for better ventilation. 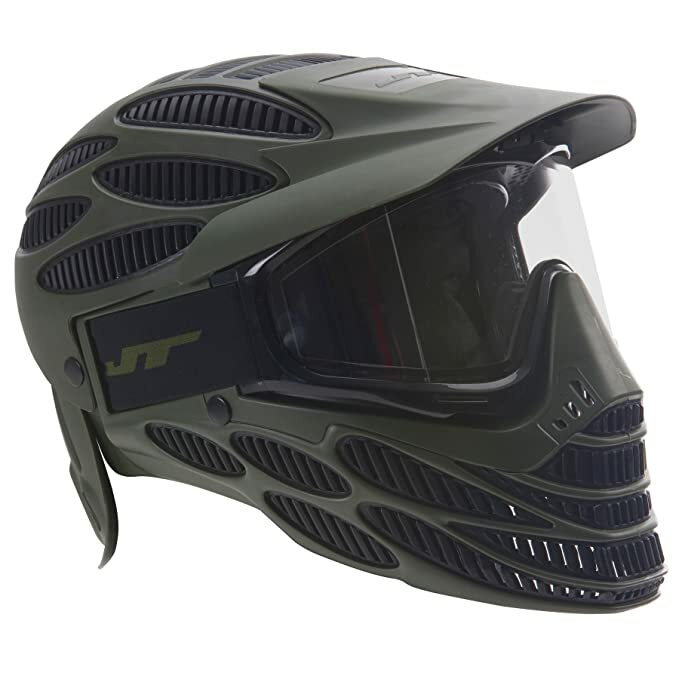 Just by looking at it, I can tell why the JT Spectra also stands out among the available paintball masks on the market – it offers stability, comfort, and utmost protection with its full head and face coverage. Although it may seem quite tight and close, JT designed the mask with vents for optimal ventilation and therefore, keeps the moisture and sweat away even while you are running and chasing in the game. Engineered with a 260-degree peripheral field of vision, you can revel in a wide and clear angle that allows you to demonstrate your distinct tactical movements with little to no disruptions. And since the lens is double thermal, it keeps the fogging off the grid and thus, clearing out your vision for a much better view. Plus, they are clear. With the built-in visor, the mask provides extra shade that can render extra protection to your eyes against the glare. If ever you are wondering where the strap is, it’s right under the outer shell at the back of the head which seemingly conceals the strap. It is adjustable and makes the mask more comfortable to wear with the secure fit. Using the correct size, the outer layers along the ears can serve as added protection to keep your ears protected but not restricted to excellent hearing and clear communication. On one note, although the foam pads can provide comfort while you are playing, they seem a bit thinner or smaller and could’ve been more comfortable if they were thicker. And since it is a closed-type paintball mask, it might feel tight or small for those who have larger heads. Made from premium quality and tough plastic, the Save Phace Diss Series paintball mask can stand up against the other masks you can find on the market. It showcases durability that is reinforced with an interchangeable lens crafted with AF, AS, and UV coatings. If you prefer a lighter and wider field of vision, the clear lens of these goggles might just suffice your needs. Sifting through a bit to its exterior, I like how it transcends with its own craft through the prints and vivid hue unlike the other types of mask that go with minimal and neutral tones. So, if you want to forgo the minimalist style and more of an artistic type or art enthusiast, this might just be the pick for you. Of course, Save Phace also spruces up the comfort with an adjustable strap just right at the back of the head. When it comes the level of protection, the mask is also engineered with a forehead plate to make sure you won’t get hurt from the paintball hits. The lens is also fog-resistant, clear, and thermal and hence, deliver clear and wide view without fogging up that much. However, due to some changes in the season or weather, it tends to fog up a bit, especially when it is humid or warm. 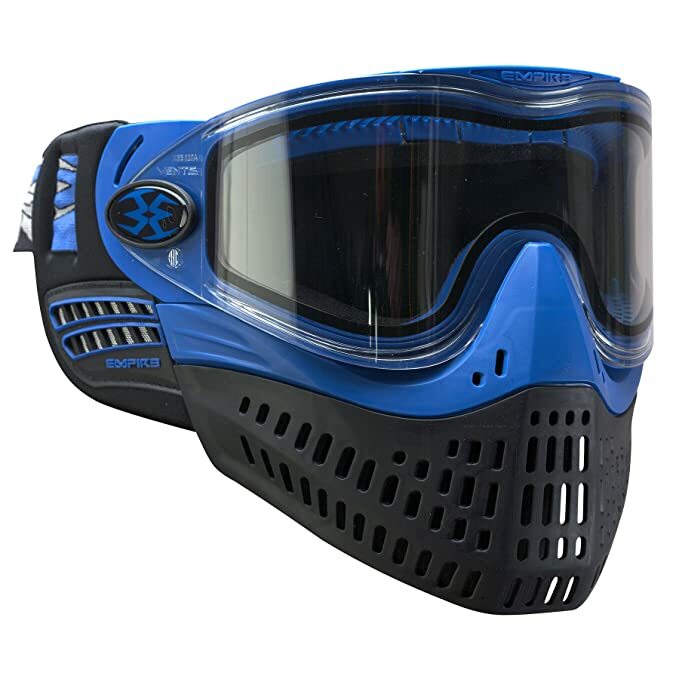 Nonetheless, this paintball mask can get you ahead of the game; it does not strain the communication port, provides optimal ventilation, and even provides ample room for prescription glasses, if ever you wear any. What are the Advantages of Wearing a Paintball Mask? Your paintball gun and mask should only be the ones exposed during the game. Therefore, paintball masks are an essential element that takes the maximum protection, optimal field of vision, and utmost comfort on the line. With just a few lapses on the durability of your mask, you might lose your chance to demonstrate your strategic movements, compromise the overall comfort, and might even get hurt during the game. Paintball game is an exciting strategy game but there is definitely no fun when you get hit on your bare skin. It definitely hurts. But taking the paintball hits while wearing a paintball mask can rarely cause pain. Depending on the size, type, and quality, a paintball mask can provide maximum protection to your face and head. With the correct fit, you can indulge in the uttermost comfort which is definitely an advantage while you are playing. You can move freely while reveling in the best view and angle with little to no disruptions. It is much easier to spot your enemies in the game with clear thermal lenses and peripheral vision. Wider or larger paintball masks can provide enough space for your prescription glasses, if you are wearing any. This also adds comfort and better visibility without straining your eyesight. With the cool aesthetics, it highlights your style and can make you look like a pro. A paintball mask can protect you against the UV rays and the glare of the sun. With no disruptions to worry about, you can focus and get way ahead to the game. You can save your face from all the messy paint stains. To fully benefit from the features of a paintball mask or goggles, it is a prerequisite to consider the significant factors and therefore, help you determine the type of paintball mask you need and suitable with the rest of your gear. No matter what sort of paintball scenarios you are in, whether it is woodsball, speedball, or scenario gameplay, comfort is inevitably crucial. When you are looking for a mask, the comfort properties include the flexibility of the straps, the foam pads, the size, and almost every part of the mask; it plays a vital impact on your performance. Therefore, never ever skimp on paintball masks in terms of comfort just to save more money in the long run. But actually, it may just turn out otherwise. It should feel snug and if you have gotten a seemingly large or small size, the straps might just do the trick as long as they are adjustable. Besides the main strap, most paintball masks are designed with chin straps to enhance the fit for more custom comfort. Take note that you are wearing the paintball mask for long periods of time and it should not be in any way too tight or loose, should trap the heat inside or cause any irritation to your skin. Comfort is the key to an exciting and fun game. The foam pads are typically lined up inside the goggles along with the eyes, nose, forehead, and chin but may still vary from brand to brand. You may differentiate the comfort of the foam pads according to its thickness although some are much thinner but still feels comfortable. Make sure they are premium quality soft foam pads or else, you’ll end up with discomfort or skin irritations. The size is definitely an important factor to always consider. Every brand or manufacturer has their respective sizing charts which can assist you to determine what size lends a perfect fit whether it is small or large profiles. This factor is also essential if you are wearing any prescription glasses. Depending on the size of the frame, specific paintball masks can accommodate prescription or corrective eyeglasses with average to large frames. The lenses of every paintball mask may vary according to the shade, size, and style. Typically, they are thermal and fog-resistant to ensure you get the best view and angle to chase, spot, or shoot your enemies. There are large lenses that provide a peripheral field of vision that deters any obstruction in the area, especially when you are trying to spot your enemies from afar. The fog-resistant and thermal features are highly significant when you are choosing the type of lenses. You don’t want them to fog up or build moisture when you are running in the field and exhibiting your gameplay right under the intense heat of the sun. Certain models offer fog-resistant lenses but at some point, still fogs up when the temperature or weather wavers. There are times when you get to choose between colors or shades of the lenses – clear, light smoke, and sometimes, a bit darker. Oftentimes, it is a combination of colors. You can consider the color of the lenses if you need extra protection against the glare of the sun or just want to elevate the aesthetics. Whatever your choice is, make sure it won’t disrupt your vision in any way. Durability defines the ability of the mask to hold out paintball hits or any airsoft projectiles. Some brands are made of premium quality and tough plastic while other paintball masks are crafted with soft rubber to enhance impact absorption and hence, won’t cause any pain. Apart from the mask itself, the overall quality includes sturdy and high-quality straps that won’t easily untie or fall off. The lenses might get also hit at times, so they should be durable enough to receive any paintball hits and won’t wear out with any cracks or damages. When you need to mount an action camera such as GoPro or any attachments, they should be intact and won’t fall off. The durability and attachment ports of the mask should do the trick. Checking the durability will also save you a lot of money, replacements or repairs in the long run. Although sometimes you may have to spend a few bucks to get the best paintball goggles, investing in a durable quality surely is a worthwhile purchase. 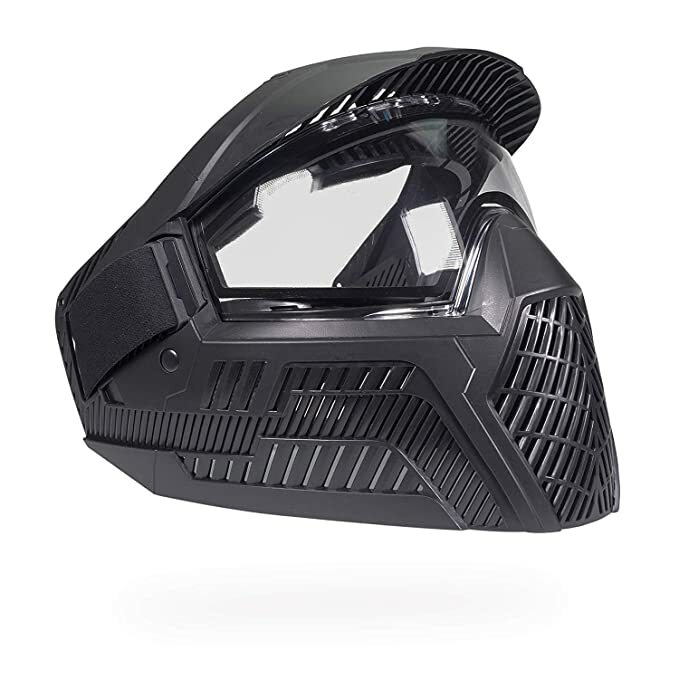 Lightweight paintball masks allow you to move more freely and easier without having to worry about a heavy cargo on your head. Due to some enhancements, certain paintball masks feel a little bit heavier than the others. But as I mentioned before, the mask has to sit on your face for long periods of time, so you have to make sure it is comfortable as much as possible. And settling on a lightweight mask is definitely one way to maximum comfort and superb performance. It is definitely such a steal when the mask you’re buying offers the utmost level of protection. Then again, paintball is an exciting strategic game but it isn’t all about the fun. Taking precautionary measures is vital and choosing a mask with features for maximum protection is inevitably preeminent among the other masks you can find. You can tell whether the mask has a great level of protection based on its overall design. There are brands that come up with built-in visors, durable outer shells for the ears, head, and back of the head to fully cover the face and hence, keep it fully protected against the elements in the surroundings and of course, the paintball hits. As this game usually takes place in the field on broad daylight, other types of masks have lenses that are coated with UV protection to protect your eyes and make sure you get to enjoy the game even under the intense heat of the sun. You do not want to let the heat trap you in and leave you soaking in sweat and moisture when you are playing the game. That is why ventilation is also a very important factor to take note of. Typically, the masks you see on the market are streamlined with vents to ensure breathing is much easier and to make sure it won’t have any room for sweat and moisture buildup. With all the long hours of playing, the heat or temperature inside tends to get worse. But with optimal ventilation, you can keep yourself cool and comfortable all the time. Some brands, however, have vents but still lacking proper ventilation. That’s why some players opt for small fans to boost the ventilation. These are often sold separately. When you are all done with the vital factors such as mentioned above, you can tick them off your list and go straight to the style and design. To keep up with the minimalist style, most paintball masks showcase neutral tones such as black or gray. If you are feeling a bit artistic, there are available masks that come in vivid hues and are designed with colorful prints. Your tactical moves or how you play the game also determines the type of paintball mask that you should wear. It may also depend on the scenario. Whether you go for a small profile or large profile, it’s all good as long as it is comfortable and offers maximum protection. Paintball masks come in a vast range of prices. There are affordable to expensive options. But most of the time, masks engineered with advanced technology or rather high-end versions tend to be much more expensive. The brand is also a factor. However, prices may still vary and you can always opt for a premium quality mask that won’t break your bank. As long as it is comfortable, offers great protection, and durable, it is definitely worth the price. Is it possible to wear a paintball mask with a prescription or corrective eyeglasses? Fortunately, yes, you can wear your prescription glasses with a paintball mask. However, it depends on the design of the mask or the room it can provide. Moreover, it is not just all about the room, but you also have to consider the foam pads inside the mask which might make the space or room much smaller or tight if you wear your eyeglasses with it. You can also consider paintball masks with adjustable straps although most of the brands you find on the market do have. This allows you to customize the fit and comfort according to your preferred level, particularly when you are wearing corrective glasses. As I have delved into their properties, some of the best paintball masks for glasses I found are Virtue Vio Ascend, Invert Helix, and Empire EVS. they can provide optimal room for prescription or corrective glasses without making the overall comfort to suffer. Which color of lenses is better? Clear, dark, light smoke, or subdued colors? It all depends on your preferences and needs. Each has its respective benefits and pitfalls. Clear lenses are probably a topnotch choice for players who prefer crystal clear visibility as darker shades tend to strain the view or angle. Clear lenses can also be a great option for those who need to prescription glasses to prevent straining the sight. Darker shades tend to do so at times. However, clear lenses might not have enough shade to protect your eyes against the glare of the sun. On the other hand, darker or lenses with light smoke hues are also an option of many players due to the protection it can provide against the glare. But in contrast to clear lenses, some might suffer from visibility problems where you won’t get the best view and angle. However, the effects may still vary depending on the brand or type of lenses. Lenses with subdued colors look actually great for cooler aesthetics or if you want to ramp up your style. The range of colors outside don’t actually affect the visibility and most of the time, works just the same as the other lenses. Is there any optimal ventilation in a paintball mask? It depends on the design or type of paintball mask. The ventilation may vary and some may have just enough while other styles don’t. If you are shopping online, it is sometimes hard to tell whether it has optimal ventilation or not. But you can check the vents further, perhaps the more, the better. The venting system is vital and should never be brushed off. It allows you to breathe easily and comfortably and also has the ability to wick the moisture and sweat away. With proper ventilation, you can keep yourself cool all the time. How should you clean a paintball mask? Should I just wash it off with water? All you need is water, approved paintball lens cleaner, and microfiber. And yes, you can wash it off with water, preferably warm to retain the quality of the mask. Others use soap or dishwashing soap to remove the paintball stains and all the grime. But you have to be careful in using soap in cleaning the mask as they can be too abrasive and will just cause damages or scratches. Never use household cleaning materials, glass cleaners, paper towels, rags, and other materials except for microfiber towel, water, and a paintball cleaner. If possible, you can contact or look up the manufacturer on how to clean the mask properly. Every brand has its respective details regarding the cleaning to make sure you still get the best quality of the mask. However, if all these aren’t possible, you can just wash it off with warm water and wipe off with a microfiber towel. But you may ask, how often should you clean your mask? Every after the game. Don’t let the mask sit on for days with paintball stains on it. It will be much harder to remove the stains the longer you keep it away without cleaning. It will only take 5 minutes of your time or less to clean it up. Another important note, do not clean the paintball mask by letting it submerge in water. Sometimes, it feels the easiest way to do but you are just letting your mask more prone to damages. Submerging it can get the water in between the panels and drying it up might take longer than it should. What is the proper way to store a paintball mask? When you are all done with the cleaning, keep it away in its case for storage. Some just hang it up but making it more exposed to different elements in the environment may cause damages or quality deterioration. And if you store it in its case, make sure it is completely dry after cleaning. Do all paintball masks come with a small fan? No, they don’t. Certain brands do have small fans inside to boost the ventilation but, most of the time, they can be purchased separately. Unfortunately, no, they aren’t. That’s why is definitely best to check the specs of details of the product thoroughly to know if the lenses are scratch-resistant. However, those lenses that are not scratch-resistant do not mean they are of cheap quality. Paintball mask lenses are typically designed to be durable and if you want to keep it from scratches, store it properly. How do I know what size fits my head or face? This is probably one of the tough questions to answer to, especially when you are shopping online. To determine the correct size, it is best to base on the sizing chart. Manufacturers always provide a sizing chart to help you pick out which size suits you best. If you are browsing the physical stores, it is all easy-peasy when you try it on. Make sure it covers your face completely and the lenses are on the correct height – the level of your eyes. The foam pads should not feel tight and must be very comfortable as much as possible. Which mask is better? Low profile (small) or high profile (large)? It is mostly based on the scenario of the paintball game you’re playing. Sometimes, it is all up to your preferences. As the name suggests, low profile paintball masks are smaller in size and typically used for speedball, although there isn’t actually any general rule regarding this. High profile masks are larger in size and probably be a better fit for those who prefer full coverage, for players with larger heads, or simply just you want it so. Choosing the best paintball mask from the pool of options on the market might seem a bit challenging for some players, especially the beginners. But with the utmost consideration of the significant factors as mentioned above, you’d be able to determine what paintball mask suits you best. On the other hand, this list of the top-rated paintball masks truly showcases superb features that are worth every penny. However, I’ve been contemplating between Dye i5 and Virtue VIO Ascend. Both stand out in their respective features in terms of comfort and function.and probably the only factor that sets their gap is the price. I won’t deny, Dye i5 is expensive but given its high-end features such as the e.VOKE Wireless Air Sync, it surely is one hell of technology and it can be integrated with your M2 for the stats and other game information. Pretty cool, isn’t it? But it’s all up to you if you’re willing to give up a few bucks. Virtue VIO Ascend, however, exhibits the basics but definitely heightened. The lens is interchangeable and can be changed quickly, has a thermal fog-resistant lens, lightweight, and very comfortable with the soft foam pads. Not to mention the optimal ventilation that makes the breathability easier. Therefore, it’s all loaded with stunning features but at a more affordable price. Copyright © 2019 Agile Paintball. All Rights Reserved.